Do Droughts Affect Well Water Quality? Yesterday we talked a little about heavy rains and well water quality so today we decided to talk for a brief moment about the possible effects that periods of drought can have on well water quality — because pretty much anything that affects the flow of water through an aquifer or level of water in an aquifer can have an effect on the quality of water produced by an aquifer. In the case of a drought the water level in an aquifer will more than likely drop since rain needed to replenish its level have not fallen. This means underground rock formations previously covered with water will become exposed to oxygen and when that happens various chemical oxidation processes may occur depending upon the composition of the rock. As an example, if the rock happens to contain arsenic on its surface oxygen in the air may convert some of the material into a form that can get carried away by flowing water when the aquifer level rises after the drought ends. The exact timing and volume of the arsenic release will go unnoticed by the average private well owner unless he or she… tests for arsenic in their drinking water. A second example of how a drought could possibly affect a region’s water supply involves sodium chloride, or as most people know it, ‘salt’. When water levels in aquifers near the ocean get too low an event known as salt intrusion may occur. Basically speaking, aquifers close to the ocean have connections to the ocean through miles and miles of underground crevices through rock formations and water from the ocean gets ‘pushed’ back toward the ocean by pressure from the water in the aquifers. But, if the water levels in the aquifers drop, so does the pressure from the water in the aquifers and salt water from the ocean then has a chance to seep its way into the aquifers. As usual we would like to say that unless private well owners will take responsibility for testing the quality of water coming from their wells they will never know for sure whether or not the water they drink themselves and serve their families contains potentially dangerous contaminants. 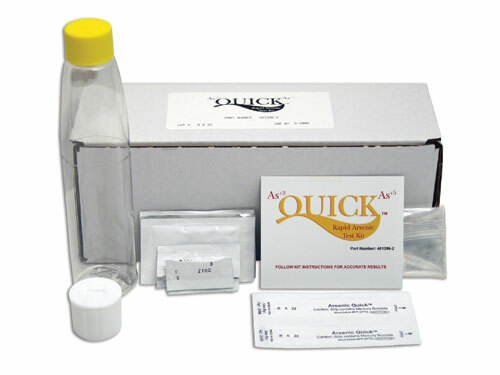 In most cases basic testing takes very little time and unlike in the past when only ‘scientifically savvy’ folks could get their hands on (and sometimes understand the directions for) drinking water test kits, today the general public can easily find water test kits in places like our online Water Test Kit Store that carries a selection of highly affordable (and very useful!) drinking, tap and well water test kits. Listen, folks… It’s your water, your health… and ultimately your LIFE so don’t you owe it to yourself to know what perils may lurk in your water?